Discussion in 'Modding' started by Soul_analyzer, 11 Sep 2014. Hello everyone, currently I am doing a case modding and I want to change my Psu's (Thermaltake toughpower 1000w) original fan with a bitfenix fan . Is this possible or will I have issues? I see the A=amber? Difference 0.70 A on the original psu's and 0.18 +_ 10 % on the bitfenix. A = amps = current draw at the rated voltage. If they're the same physical size, and have the same standard connectors, it might be worth a try. Can't tell you if it's safe or not. Should be fine. The fan will only draw what it needs as far as I know. There are some concerns when replacing PSU fans. PSU fans are usually selected because they have very low starting voltages, like 3V or so. Many fans will only spin up around 5-7V, but I couldn't find any info about that replacement fan. Another issue I can see with that BitFenix is that it is only capable of roughly half the CFM of the original Yate Loon. Since most people rarely even use 50% of their PSU's capacity I'm not that concerned, but it is something to keep in mind since if you do actually ask it to supply 800W+ it may overheat and shut down depending on ambient temps. I've done this a few times, never with that fan or that psu. Sometimes the fan is hard-wired so you may need to do some soldering. As shinji2k said you should pick a fan with similar or better airflow (a higher quality fan will probably achieve this quieter) and psu's that vary fan speeds should have a fan with a lie starting voltage, though you could argue that it will still start before any overheating occurs it's best practice to upgrade the fan and it's starting voltage is one facet to consider. I did bought a new fan and I think it's quite good. The http://www.nzxt.com/product/detail/92-fx-140lb-case-fan.html. But there some isues. 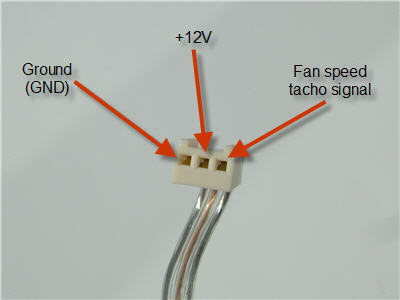 the 3 pin fan to a 3 pin socket but this way the 2pin socket of the PSU will be empty, will this cause a problem? Does anyone know how to open the fan so I can see the wiring inside it? Your old fan will have +12v and -0v, same on your new fan plus signal, colours are usually Red Black, Yellow. If they are all the same colour on your new fan you can tell by the pins, Google will provide you with a wiring diagram (I'm on my phone so can't quickly look one up). If your psu fan is temp controlled you can set your new fan to H, if not I'd try M but H is the safer bet. It should cause no problem to run your fan from outside the psu, I've done that before, it MAY reuse to play if it thinks it's fan is broken but unlikely. Things like this have been standardized for many years. Match red to red and black to black and ignore the yellow rpm wire. On your PSU the red wire will be +12V and the black will be GND.